I hope you all had a wonderful Christmas and are recovering! Many thanks for your entries for our previous sketch challenge, such beautiful works! Its been a busy hectic time for everyone so I thank you for taking the time to join us! Also a big thank you to Debbie Dolphin for being our special guest and to Donna's Den of Crafts for the £10 voucher! 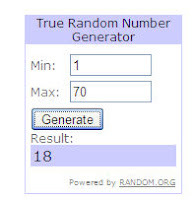 The winner of Donna's Den voucher is....CHERYL! Now if you're anything like me you may not have bought the item this year, it may have been in stash for a while until rediscovered and its become a new best friend! Please post links to your entries in the comments box below by Monday 11th January 2010 at 12pm GMT. We are sponsored again by Joanna Sheen who has such a huge assortment of craft items to suit all tastes in her online shop. Her newest items are more colours of memento inkpads, essential if santa brought you promarkers or copics! Meltdust powders and papers which is a fabulous new product for embossing computer printed images, I soooooo want some of these! There are lots of new CD's, the new promarker starter sets and the sought after Martha Stewart punches, go check them out! This simple card uses a new stamp I've got which came in a set from Kodomo called Birds. I love these stamps they are so detailed (and cheap, Lol). I have stamped it with Brilliance Black, mounted it on silver and then layered it onto a piece of white card I ran through my faithful Cuttlebug with the Birds and Swirls folder. All is then mounted on a white card blank. 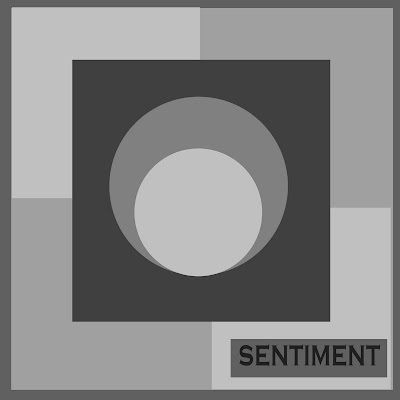 The sentiment is a peel-off stuck onto a piece of silver card. As that cute little lemur says - simples! I used a pale cream coloured card which had a wavy side which is narrower on the front than the back, I added a silver Oval shape which had a similar wavy edge using double sided tape, and having used two of the circular flower stamps which I had bought from Studio24 and coloured them using watercolour pencils I stuck them onto the card using foam pads, finally I added some yellow stars on the inside of the card. I decided to make this challenge using the promarkers I got for Christmas this year, I have also used the gorgeous brads and jewels I received from secret Santa!! The main technique of the card is matting and layering which is my favourite and the image is stamped and coloured using the promarkers (need a bit of practice !!) I added the brads and jewels for extra effect. I've had lots of favourites this year - as I only started stamping earlier on in the year a lot of things have been 'new favourites' for me too, so it took me a while to decide what I'd use for this card! I've been quite hooked on Digistamp Boutique images so I chose one of their new ones, coloured with my favourite promarkers. The papers are Doodlebug, with DCWV cardstock. I've used some Green Tara flowers with a little button centre, and added a little butterfly sticker (mounted onto acetate and cut out) in the opposite corner. The fancy frame is made with Nellie Snellen circle dies, which have been a bit of an obsession for me for the last couple of months! 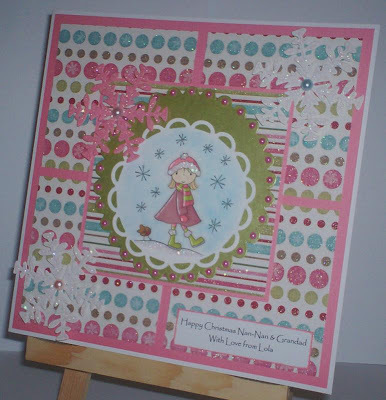 The favourite products I have used for this card are Clare Curd papers from Papermania and the Cuttlebug Butterflies dies. I have wanted those forever and have used them loads. 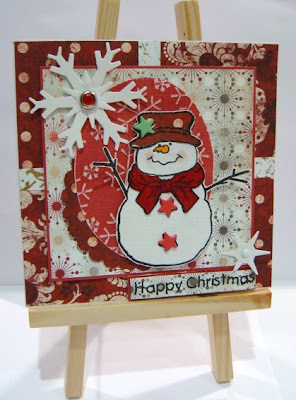 The dotty texture used here is my favourite and looks great when used with sanded cardstock to distress it. Of course bling in any guise is a must too :). The central panel on this card was made by scoring a grid pattern and sewing a small bead at each intersection. It took ages to do but the results were amazing and worth the effort for a special card. My favourite things for 2009 and also new to me were copics (May) and promarkers (August) and digital stamps (about the same time) and also the large bead caps used as flower centres, K&Co papers, beads and charms. 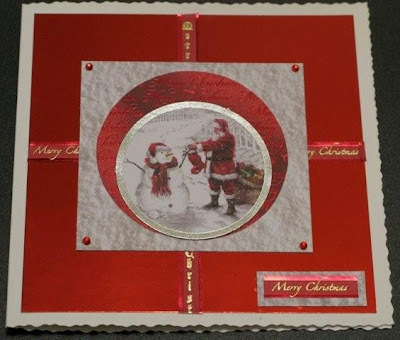 Now may I have the pleasure of introducing our special guest designer for this challenge which is Vicky from Kip's Cards! Vicky is a regular player on our challenges and keeps catching my eye not only for her beautifully creative work but also the photography surrounding the creation too, that is as much of a pleasure to look at as the card itself! 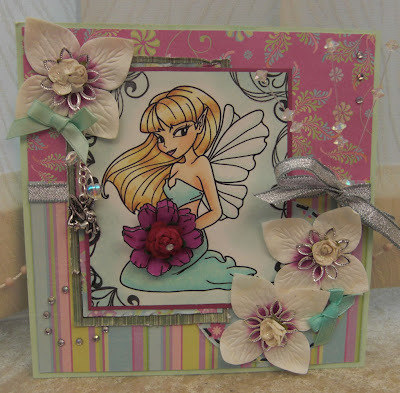 Hop over to her blog and see more of her stunning creations, you wont be disappointed! Vicky also posts up tutorials from time to time so well worth checking back to see whats new! Thank You Vicky for being our special guest! Thank You for entering this sweet card Rachel and I love the 3d flowers! Gosh thank you for all your fabulous entries for our previous challenge, what a wonderful array of colours and stamps and many many thanks to Jo Capper-Sandon for being our special guest designer, do pop over to her blog as its always packed with fantastic creations & great ideas. Also thank you once again to the delightful Joanna Sheen for sponsoring us again! Just a quick note about entry comments. I've had to change the settings to blog owner approval because of spam being posted on the last challenge twice and I can't approve comments until I'm on my lappy usually after the kids go to bed (late!) at night! So don't worry if it doesnt appear straight away, just check the next day as it should be there then. We're sponsored for this challenge by Donna's Den of Crafts and have a £10 gift voucher to spend in her online shop. Donna's Den stocks a range of items including brand names like Smirk, DCWV, Dovecraft and My Craft Studio, with lots of little treasures and goodies to be found. Pop over to have a look! Donna also runs a challenge blog exclusively for Mens/Boys cards. We all have to do them sometime and she has a fabulous design team with tons of inspiration. Cards for Men challenge blog is here. I hope you have a lot of fun with this sketch as we have and thank you to our Design Team for all the hard work, time and effort they put into making this blog and to our special guests who willingly share their time and skills with us. Have a very Merry Christmas everyone and we'll be back on Dec 28th (Also my birthday yay!) with our next challenge. 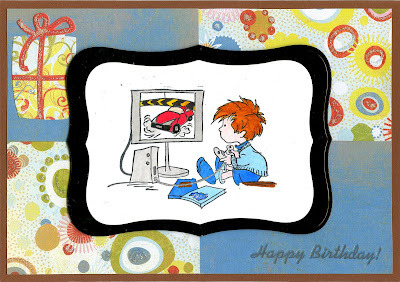 I started with a blank square card, cut the mirror card to size and stuck onto the card added the strips of messages. I then used some snow effect 3D card which I have had for a while the 3d effect does not show very well. Not having a circle cutter I cheated a little and drew around a roll of double sided tape to cut out the larger of the two circles, I then mounted the circle picture that I had chosen. I finished off with the sentiment and some gems. I used the sketch as a layout inspiration for an A5 card. The base was made from an A4 sheet chocolate coloured cardstock with papers from Basic Grey Cupcake pack. The gift parcel in the top corner is a cardstock sticker from the paperpack. The sentiment in the bottom corner is a Letraset rub on and I have added Stickles glue to add some highlights to the patterned paper. 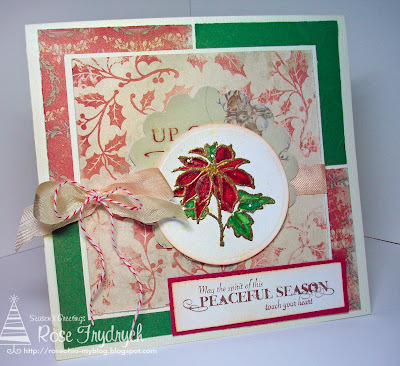 I used Prickley Pear Rubber stamps for my images and Melissa Frances paper. I glittered up the image the Poinsetta image after I colored it with Prismacolor Markers. I sprayed the entire card lightly with Gold Glimmer Mist. The 4 squares backing paper is a printout from designer extreme vol 3 and I added a square of blue card beneath the circle that matches the base card and stamped around the corners with a star stamp from Tracey Coates' butterfly beauties sheet. The sentiment is from Tracey's Starburst Fairies. Now may I have the pleasure of introducing our special guest for this challenge, Debbie Dolphin! Debbie has a project in the current issue of craft stamper magazine which is also a great idea for those last minute gifts. 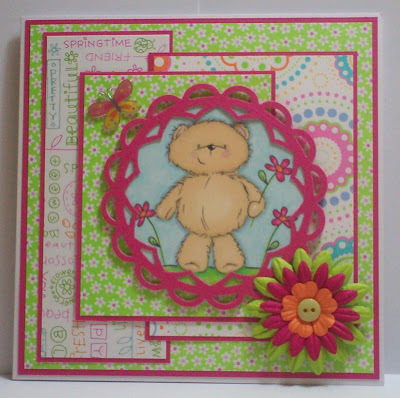 She is lucky enough to work at The Stampman and has produced some beautiful designs using their stamps, hop over to her blog and check them out! Recently I have featured in the latest copy of Craft Stamper which has been something I have always wanted to do.